Folks on both sides of the political divide sure do have a lot to say about the 45th person to be elected president: Mr. Donald J. Trump. But one thing that political commentators rarely bring up is the fact that, before he threw his hat in the ring as a Presidential candidate, he threw his hat in an actual ring — as a WWE super-celebrity. Get raw! 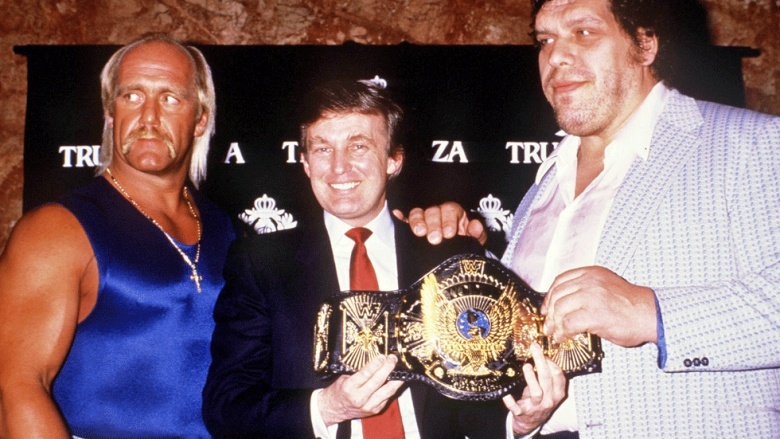 Let's take a look back at Donald Trump's strange history with professional wrestling. Before Donald Trump took the world by storm — first with his hit reality show, The Apprentice, and then the slightly more impressive feat of winning the 2016 U.S. presidential election — he was best known for his very, very large and ostentatious buildings. And it was Trump Plaza in Atlantic City, New Jersey, that first forged Trump's connection to the WWE. Just like other sports leagues, the WWE has one big annual event that's the biggest blow-out of them all. Instead of calling it something lame like the "Finals," or the "Super Bowl," or the very inaccurately named "World Series," the WWE takes the cool road and calls it "WrestleMania." Think of it as a severe mental illness where all you desire to do is just hit every single person you can with a chair. In 1988 and 1989, Wrestlemanias IV and V were held at the Historic Atlantic City Convention Hall, and were sponsored by the Trump Plaza casino hotel that sat next door. This would not only give us wonderful visuals of angry, musclebound, oily freaks angrily walking down the stairs, it began a relationship between Trump and WWE that would evolve, and has not, as of this moment, actually ended. It turns out that, sadly, "you're fired" is not actually an original Trumpism. 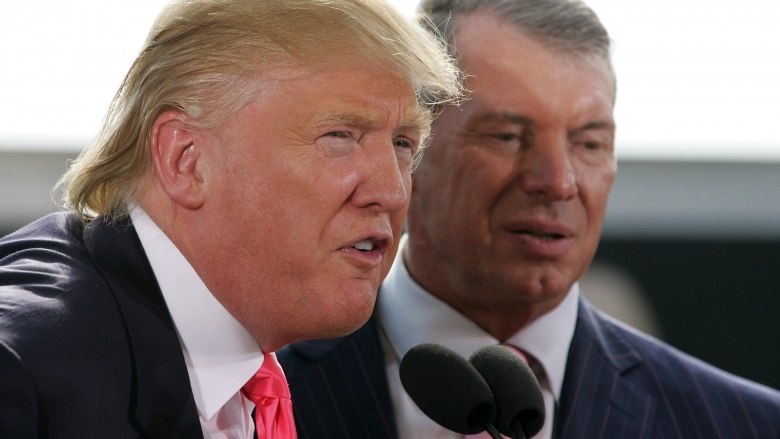 The Donald's catchphrase actually seems to have come from Vince McMahon, CEO and Chairman of the WWE. McMahon started firing his underlings in dramatic fashion in the late '90s, while Trump picked up the trend years later, in 2004. And of course, McMahon had his revenge in 2009, when he flipped the script on the Donald. "The Battle of the Billionaires" was a battle between Trump and McMahon. It started when Trump dumped a bunch of money on WWE fans and McMahon decided that the next logical course of action was to challenge him to a fight. Unfortunately, The Donald and McMahon had two wrestlers square off for them by proxy, and didn't actually fight themselves. Well, maybe they fought a little. In the end, Trump took the victory and shaved McMahon's head afterwards. Because reasons. 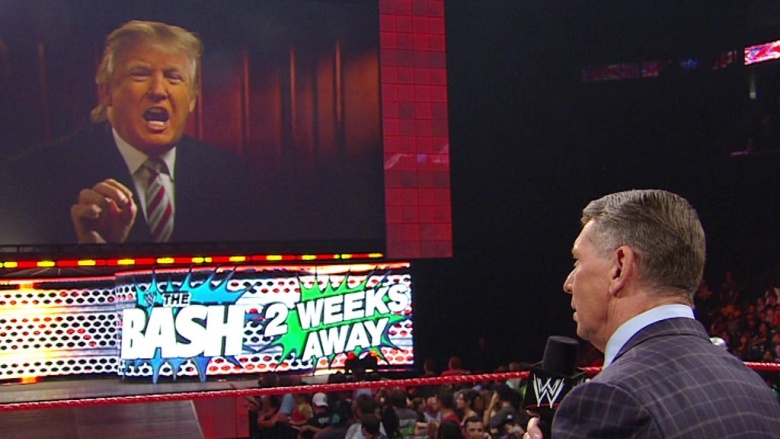 In 2009, Donald Trump showed up again and announced he had "bought" WWE's Monday Night Raw. Faced with the prospect of Trump being in charge of something so precious, so important, McMahon did the only thing he could think of: he opened up his checkbook and just bought it back a week later. Phew! Crisis averted! No matter what Donald Trump does from this point on, he'll always be the first WWE Hall of Famer to win a presidential election. That puts him in the company of other Hall of Famers like Million Dollar Man Ted Dibiase and Sergeant Slaughter. And hey! There's probably no two people better suited to take on the roles of Secretary of the Treasury and Head of Homeland Security! And what about that other WWE Hall of Famer who's already had years in politics? As you may know, this isn't the first intersection of the body politic and bodyslams. Back in 1991, Jesse "The Body" Ventura was elected mayor of Brooklyn Park Minnesota, a job he held until 1995. A few years later, he dropkicked both the Democrats and Republicans, and took office as the Governor of Minnesota in 1999. A few years after that, however, Ventura was considering setting his sights even higher. Which brings us to this eerily prescient ringside interview between Ventura and Donald Trump in the above video. Remember earlier, when we said his relationship with WWE hasn't actually ended? This is what we meant. See, WWE's stock hasn't been doing so great lately. Perhaps because all of its best and most famous wrestlers have started to become politicians or actors, leaving no one interesting behind. Or maybe it's because the WWE is such a nineties-era thing, like Jerry Springer, faded jeans, and grunge. (Wait…) But, luckily for them, their stock isn't as low as it used to be. 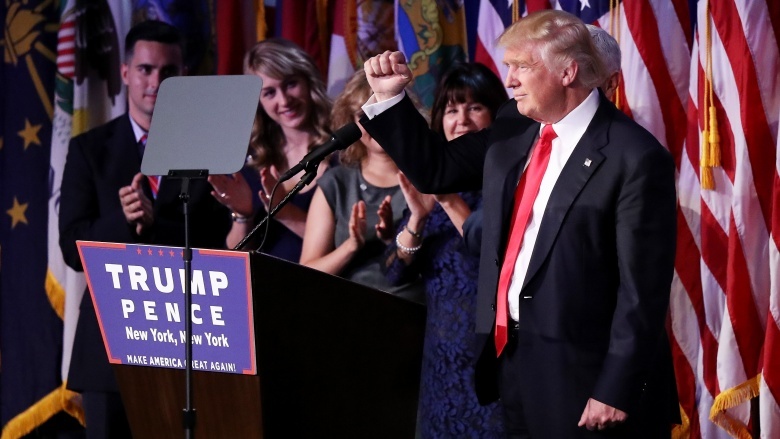 See, after Presidential hopeful Donald Trump transformed into Presidential-Elect Donald Trump, WWE stock shot up five percent, due to how he's closely connected he's been to WWE over the years. You know what? Stone Cold for President, cuz Grunge.com said so.